Lean Napoleon's Triangles: What is this about? 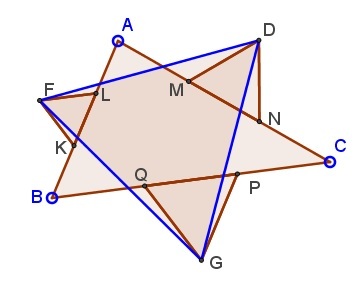 On the middle thirds of ΔABC construct (similarly oriented) equilateral triangle, KLF, MND, and PQG. Then ΔGDF is equilateral. The proof is said to be computational but not tedious. ΔAKF is isosceles, with ∠AKF = 120°. So its base angles (KAF and AFK) are both 30°. It follows that ∠AFL = 90° which makes ΔAFL right. If, as usual, AB = c, then in ΔAFL, AL = 2c/3 and LF = c/3. By the Pythagorean theorem, (AF)² = c²/3. Similarly, ΔAMD is right and (AD)² = b²/3. We are now in a position to apply the Law of Cosines in ΔADF to determine the length of DF. Note that ∠DAF = ∠A + 60°. where S is the area of ΔABC. (We again used Law of Cosines and also a formula for the area of a triangle.) The expression is symmetric in a, b, c so that (GD)² and (GF)² are bound to be equal to the same quantity, proving that indeed ΔGDF is equilateral. with the same conclusion. Thus we are led to two equilateral triangles related to a base ΔABC. 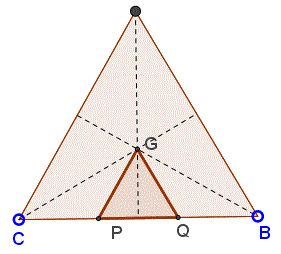 From the above relations it follows that the difference in areas of the two triangles is exactly that of ΔABC. As James Bond drops on an occasion in "Tomorrow Never Dies", "They'll publish anything these days."